The Americans with Disabilities Act (ADA), a federal civil rights law, determined the minimum requirements for recently designed and constructed or altered state and local government facilities, public accommodations, and commercial facilities to provide equal access to inaccessible facilities by individuals with disabilities. Accessibility standards purpose to overcome this inaccessibility by setting many prescriptive dimensional or scoping requirements that are legal, design, or construction minimums. 2010 ADA Standards are the current approved guidance that have been issued by the United States Access Board and adopted by the Department of Justice to enforce the ADA. Nothing in the 2010 ADA Standard requirements prevents the use of designs, products, or technologies to provide substantially equivalent or greater accessibility and usability. In recent years, number of individuals using wheelchairs has grown, as has the variety of wheelchair types and sizes. 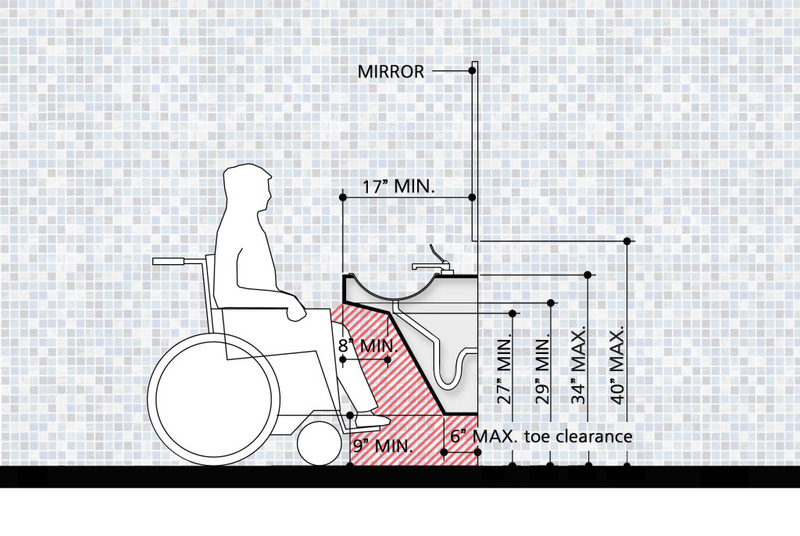 The basic needs of a handicapped person using a wheelchair, paths of travels and the space the wheelchair require are used as a primary source of design information to set minimum standards for accessible ADA restrooms. Based on the research it is concluded that individuals using wheelchairs need turning spaces in restrooms to move. That is the main idea behind providing extra space for handicapped users in bathrooms. A 60 inch (1525mm) Circular Space is the minimum design requirement that allows a person using a wheelchair to make a 180-degree or 360 degrees turn in the corridor of the bathroom. A level and clear corridor leading to the accessible Bathroom's out-swinging door is recommended to be 48 inches (1220mm) minimum wide to provide mobility to the handicapped user. The handicapped unit's doorway must have a clear opening 32 inches (815mm) minimum width when the door is open 90 degrees. Wheelchair Accessible Stall and the Ambulatory Accessible Stall are two basic toilet compartment designs set in the ADA Standards. In the,Wheelchair Accessible Unit; the depth must be 56 inches (1420mm) minimum for wall-hung toilets and 59 inches (1500mm) minimum depth for floor-mounted toilets. The minimum width measured at right angle from the side wall is 60 inches (1525mm). If the minimum amount of space is not provided in the handicapped unit, the person using a wheelchair cannot maneuver into proper position at the stall. The toilet must be offset on the back wall with the toilet center line 16 inches (405mm) minimum to 18 inches (455mm) maximum from the side wall or bathroom partition. Grab bars must be mounted on the rear wall and on the closest side wall or partition to the toilet. Ambulatory Accessible Unit has a depth of 60 inches (1525mm) minimum with 36 inches (915mm) absolute width dimension. Doors must not swing into the minimum required compartment area. Door pull hardware must be installed on both sides of the door near the latch. The toilet must be located on the back wall with the toilet center line of 17 inches (430mm) minimum and 19 inches (485mm) maximum from the side wall or partition. Grab bars must be provided on both sides per side wall requirements. Mounting Locations and the proximity of equipment are important for people who use wheelchairs and who may have limited reach range because of their disabilities. The design standards reflect these disabled users’ needs in the mounting heights for common accessories, such as mirrors, paper towel dispensers, waste receptacles, soap dispensers, napkin/tampon vendors, and toilet partition-mounted equipment, including grab bars, toilet tissue, and seat-cover dispensers, and sanitary napkin disposals. To allow use by people with limited reach range and disabilities, it is required that accessories be mounted with their “operable parts located between 44 inches and 48 inches (1120mm and 1220mm) above the finish floor. Lavatories are important features in public restrooms to provide hygiene. At least one area in each restroom must meet or exceed 2010 ADA Standards for accessible lavatories to provide a hygienic experience to everybody including handicapped users. 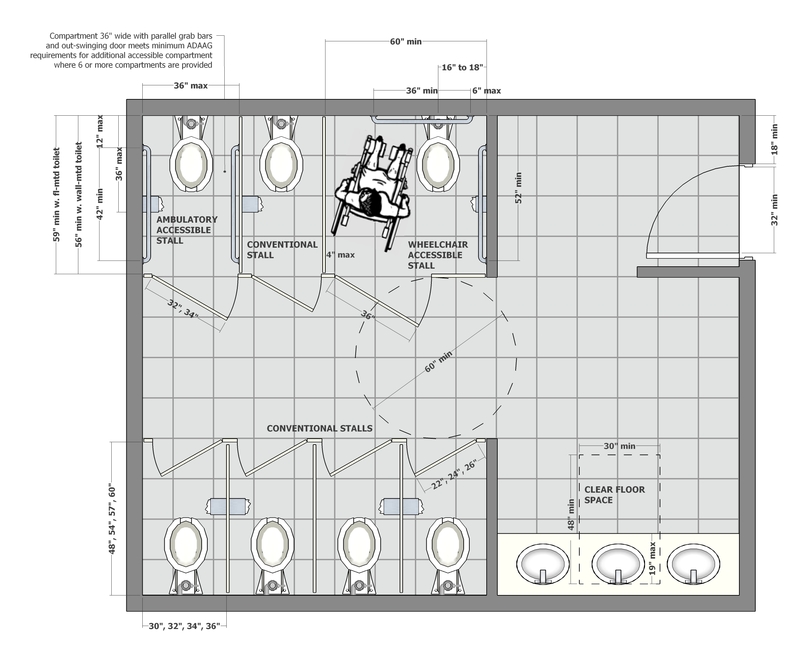 An Accessible Lavatory must be installed with the front of the highest point of either the rim or counter surface, 34 inches (865mm) maximum above the finish floor, and have a knee clearance of at least 27 inches (685mm) minimum from the bottom of the apron to the finish floor. The knee clearance must extend at least 8 inches (203mm) under the front edge of the lavatory.